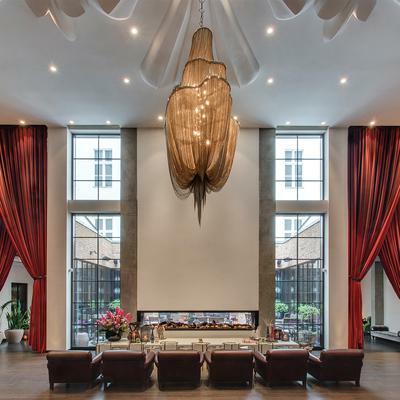 Copenhagen is a true epitome of Scandinavian style; a set of designer furniture in almost every space you enter, fashionable cycling commuters, hidden waterways, new-wave coffee shops filled with hygge and breath-taking design hotels, such as Nobis Hotel. The latter is known for its love for contemporary design and architecture, but also for the classic and the timeless in contrast. With a prime location next to Tivoli Gardens, Copenhagen Central Station, City Hall Square and the internationally renowned Ny Carlsberg Glyptotek museum, guests can easily enjoy the comfort of being within walking distance to all the delights that the capital has to offer. But thet are also welcome to stay in and discover the Scandinavian architecture in this historic building from 1903. We just had our ambassador, Andreia from Lisbon enjoy Nobis’ world-famed hospitality, attentive service and prime design. And so she did. Are you dreaming of a real retreat accompanied with laidback luxury? We might have found the ultimate rural getaway for you. Stepping feet in the magnificent work of Mother Nature - the land of the thousand-shades-of-green, São Miguel, Azores - after a couple of hours in the air no one can wish for a greater nest than the White Exclusive Suites & Villas. Located on the south coast of the island of São Miguel (only a fifteen-minutes-drive from the airport) right by the Atlantic Ocean, the White used to be two 18th-century summer houses. History has it that it belonged to a winery at the time. The resort has been flawlessly renovated to a house of nine suites and one villa, yet you’ll still be able to see the old house parts incorporated in the new design. The whitewashed modern look of the White is mixing typical Azorean architecture with a Greek influence. Opened last summer, the manor has all the retreat facilities one craves to indulge in. Ready to take a look around? As the best time of the year - CHRISTMAS is approaching, we have a big surprise for you! We have teamed up the The Guesthouse Vienna to give away a one-night-stay for two. By entering our GIVEAWAY one of you'll have the chance to win an overnight in a deluxe room with view towards the Opera and the Albertina Museum. Equipped with a huge lounge window, cosy living room area, bathtub and rainforest shower, you will be experiencing one of your best hotel adventures ever. To participate and be the happy winner do as follows: 1. Follow Local's Lore and The Guesthouse Vienna on Instagram and Facebook. 2. Tell us with whom you would stay at the hotel in the comment section and tag #localslore on your cosiest Christmas mood picture on Instagram. 3. The winner will be asked to share a story of her/his journey in Vienna as using our Vienna guide. The giveaway starts on the 4th of December 2pm CET and ends on the 25th of December 2pm CET. The winners will be announced on the 25th of December 4pm CET here on the site, in The Guesthouse Vienna lore. We wish you the best of luck and happy holidays! Our winner is @linneajv! Congratulations and Merry Christmas! To get into the festive mood we have spoiled ourselves with a special getaway weekend in Vienna. Being truly one of our favourite cities and having the chance to explore it many times already, we decided to stay at The Guesthouse Vienna right next to the Opera and Albertina Museum. Being famous for its stylish rooms and amazing brunches, we had one of our greatest hotel-experiences. HOME. HONESTY. HERITAGE “Be a guest in your own house” – this is the philosophy of The Guesthouse Vienna. This hotel concept enables people visiting Vienna to feel as if they were in their own home – giving them the chance to experience the proverbial “Gemütlichkeit” or “chillaxed” atmosphere of the Austrian capital. This is exactly the mood we felt, when sitting in the reading corner and staring out to the city filled with Chrismas lights, while sipping hot tea. Want to get in the mood too? Read on! Want to experience the mood? Enter our giveaway! We have a confession to make; first time in Amsterdam, first time at The Hoxton. But definitely not the last! This miracle place was a great surprise indeed. Venice is said to be the city of canals but as you walk and look around the only thing you see; little boats floating on the water. Setting foot in Amsterdam, we can easily say that we've just arrived to the land of canals, which we got to enjoy even through our hotel room's windows. Just like their doors, their minds are open too, says The Hoxton about themselves, rightfully. This is exactly what we have experienced throughout our stay last weekend where we got to meet and blend with locals just as much as with like-minded people from all over the globe. Ever since the first Hoxton opened in Shoreditch, way back in 2006, they’ve never just been about offering a bed for the night. They want to be more than that: providing a place where guests can hangout alongside the locals and submerse themselves in the neighbourhood with vibrant, welcoming public spaces. Welcome to Hoxton! Opened in June on the Lower East Side, Public Hotels aims to make luxury available to all thanks to Ian Schrager. The hotel is - as it says - "refined, sophisticated, smart and simple, yet flamboyant and provocative, all at the same time." The universally appealing guest rooms are thoughtfully designed, down to every last finish and detail, with distinct zones for sleeping, relaxing, working and entertaining. There has been seamless, frictionless technology integrated so everything one needs is within arm’s reach. The building was designed by Swiss architecture studio Herzog & De Meuron, that certainly implies luxury. The neon-lit escalators quickly became the new treasures of Instagram and the tangerine-feel lights the obsession of many Instagrammers. Will it become yours? Heading to Mexico and in need of a nest? Lo Sereno Casa de Playa is a beautiful boutique hotel curated for the modern traveler. In search for a hidden bliss away from home, the hotel is designed for those that wish to escape and find serenity during their stay. Being located right in between the mountains and the Pacific Ocean, the hotel indeed lives up to its name. Troncones is though a world-class surfing spot in Mexico, but if you would rather go for the hights than the depths the mountains are just a short drive away. Lo Sereno boasts a year-round outdoor pool and also guests can enjoy the on-site restaurant serving gourmet Mexican dishes, sourcing local fresh ingredients daily. Lo Sereno provides all the amenities a modern traveler may desire, curating brands worldwide for an all-sensory experience. Wondering where to stay in New York while enjoying a chic Scandinavian surrounding and supporting a good cause? We might have the ultimate choice for you. Nordic minimalism, comfort, laidback elegance are the words that well describe one of our favourite “temporary homes” in New York. The most striking thing about the hotel is though their consciousness in every aspect of their business. 11 Howard lives up to its motto “conscious hospitality”. The hotel donates a portion of its revenue from each stay to the Global Poverty Project: a non-profit aimed at reducing extreme poverty. Other than the design-focus, being conscious in terms of traveling is the point where Local’s Lore and 11 Howard’s vision met.